One of my main reasons for starting this blog was to have a place I could share the cool costumes I’ve made for my son over the years. Sewing isn’t really my thing, so buying articles of clothing have often saved me time and energy in costume making. With the variety in pre-owned clothing stores, from Goodwill to Value Village, if the right clothes aren’t part of your child’s wardrobe, quite often they can be purchased quite economically. 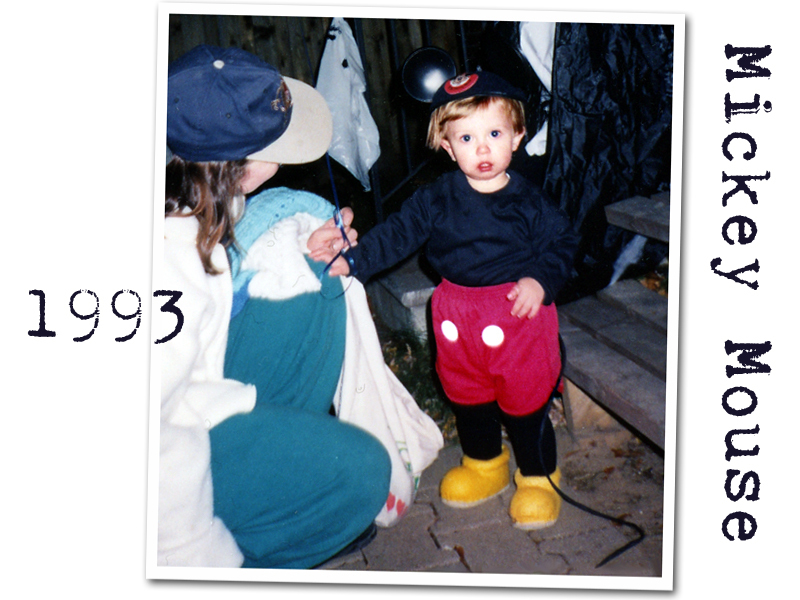 When Aunt Cindy came back from her Disneyland vacation, she brought my son Mickey Mouse ears with his name embroidered on them. This became the first piece of my son’s first Hallowe’en costume. For Mickey black tights and a long sleeved black cotton turtleneck were essential base pieces. We wanted the classic original Mickey look, so my son’s red shorts were just the thing. I just needed to sew two large white buttons on the front, and another two on the back, where I also attached a piece of (untwisted) black raffia for the mouse tail. Mickey wears 1930’s era white gloves, so I altered a pair of the little stretch gloves that can expand to fit adult fingers. Since Mickey (like many cartoon characters) has only three fingers, I removed one finger from each glove, so two fingers have to share a finger in the glove. Then I used a black marker to draw three black lines on the back of the hand part of the glove. Opa and Oma helped out with the classic Mickey Mouse shoes. 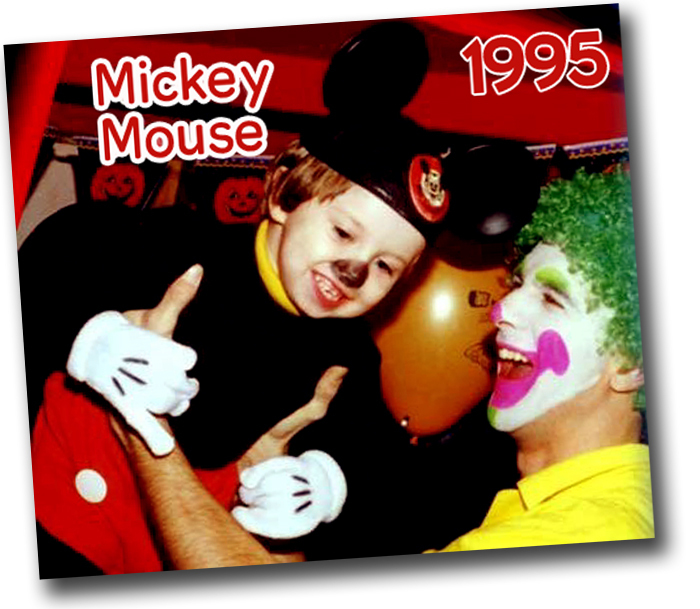 Using stuffing and yellow felt, they made over a pair of toddler slippers into the bulgy yellow shoes Mickey Mouse wears. Both my husband and I grew up watching the Gerry and Sylvia Anderson supermarionation “Thunderbirds” television series. As a science fiction fan, I had been looking for a chance to see it again for years, but it was only reissued here when our child was small, so he grew up watching it too. Blue turtleneck and sweatpants formed the costume’s base. I used a vinyl fabric with a fuzzy white backing to make the sash, and glued on velcro for the closure. The sash also had a belt loop to hold tools (a yellow flashlight went there) and a plastic friction-spark gun was just perfect to serve as Scott’s ray gun that fills the holster on the other side of the sash. The glue did not hold up very well, and has been repaired with clear packing tape at this point. More of the vinyl became boot covers, which can be pulled on over ordinary shoes. 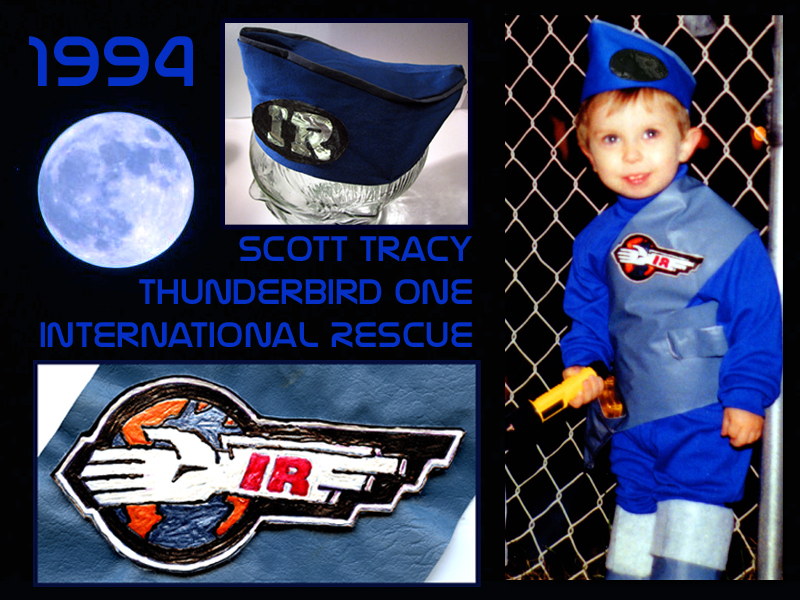 I used acrylic paint to recreate the International Rescue logo on the sash. The oval IR logo on the hat was made by painting the black outline over metallic silver paper, then glued onto the pilot hat. The hat was fairly simple to make for a novice. The hardest part was incorporating more blue vinyl as piping. To help the hat stay on, I attached a bit of elastic that ran unobtrusively behind his head under his hair. He was very proud to trick-or-treat as Scott Tracy, but was annoyed at how many people had no idea who he was supposed to be. Two years later, when he had a better grasp of Hallowe’en, since we had moved (and had a new audience) my son chose to reprise the role in the new neighborhood. The slippers no longer fit, and he chose instead to wear ordinary running shoes. After trick-or-treating, we went to the Brampton Pizza Hut Hallowe’en Party, where he’s pictured above with KooKoo the Klown. 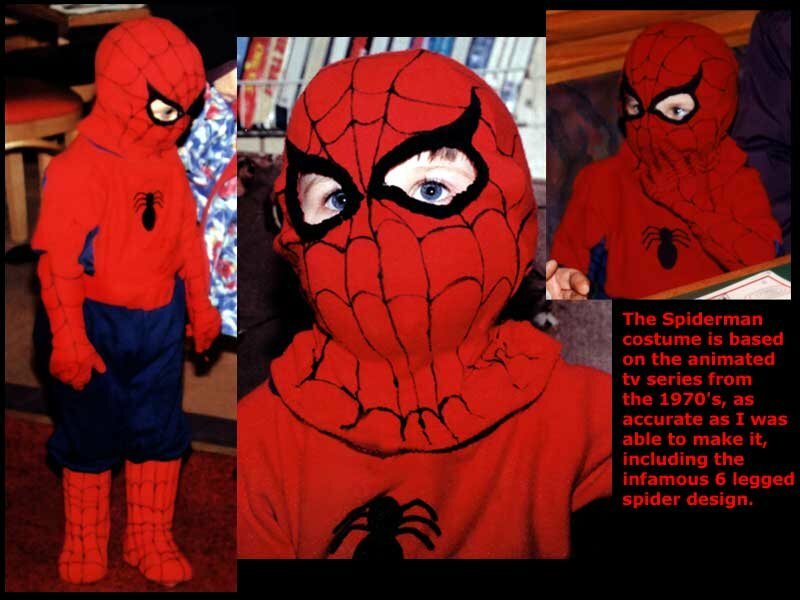 The costume is based on “the real Spiderman” which to me is the Spiderman from Ralph Bakshi’s animated 1970’s television series. Conveniently, my son agreed. The costume was created from a red sweater that Nanny would have sent to Goodwill had we not snagged it. Blue sweatpants formed the base, and I cut up the sweater into bits I then sewed into the head, sweater, boot covers and gloves. I used a bottle of black silk screen paint to make the web detail work. 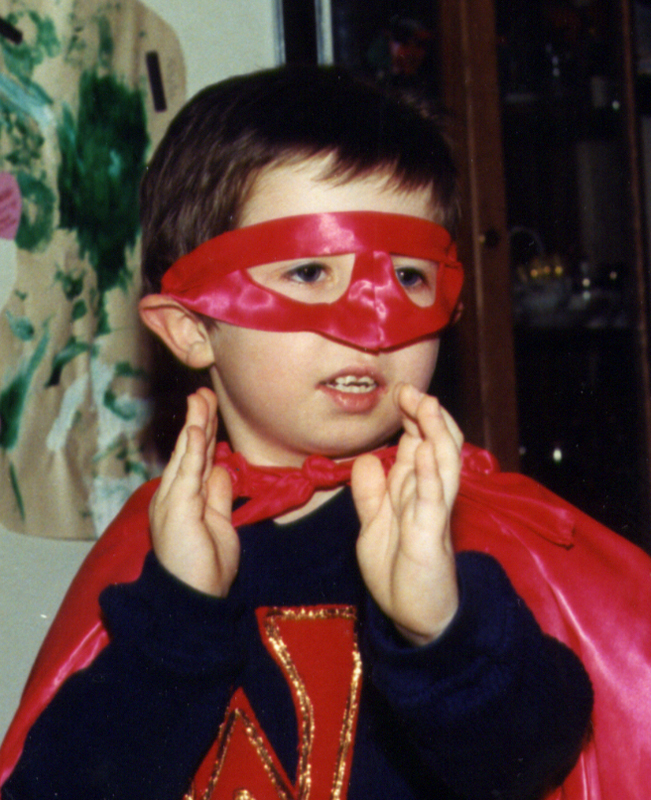 At this age my son often spent time drawing pictures and making up stories about his own super namesake, so that was who he decided to be for next Hallowe’en. This was kind of fun because I had a lot more freedom of design.